Despite his explosive defeat last time, Bagura has returned... as a brain in a jar! 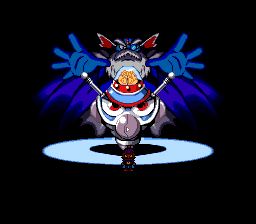 He's rightfully miffed, and has summoned the Bomber Shittenou (led by Great Bomber) to get revenge on Bomberman and his allies. An attack on their shuttle strands Bomberman and friends inside a wormhole that lands him millions of years in the past! 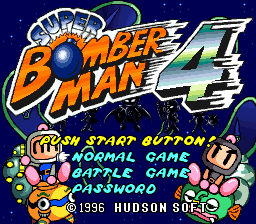 Bomberman and pals must work their way back to the future and stop Bagura from whatever malicious scheme he has planned! Ditching the core mechanisms, this game brings back the "defeat all enemies" gameplay but also makes a few interesting additions: Louies are gone, but you can now ride certain enemies, and even stow multiple eggs at a time! There's new items, new gimmicks, and for the first time in the series, character-specific special abilities to use in the Battle Game! This also introduces the Bomber Shittenou... who would make only one appearance after this game. Stinks, doesn't it? 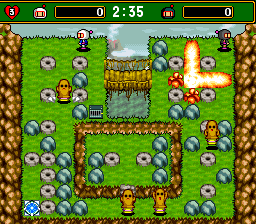 This game would seemingly serve as the groundwork for Neo Bomberman, which borrows the organic/mechanical eggs, the cages, and even the special abilities in the Battle Game. Shogakukan published a guidebook for this game.